Driffield had a small workhouse at the south side of Cross Hill dating from 1742. Other local workhouses existed at Hutton Cranswick, Kilham, Nafferton and North Dalton. The Nafferton workhouse was located on what is now Station Road, opposite Feoffee Cottages. There are only 3 inmates in the Poor-house, many receive relief at home, which appears to be more convenient for them and not disadvantageous to the parish. East Riding: Bainton, Beeford, Bracken, Brigham, Butterwick, Cottam, Cowlan, Garton-on-the-Wolds, Great Driffield (2), Little Driffield, Eastburn, Emswell with Kellythorpe, Fimber, Foston-upon-the-Wolds, Foxholes with Boythorpe, Gembling, Helperthorpe, Hutton Cranswick, Kilham, Harpham, Great Kelk, Kirkburn & Battleburn, Langtoft, Little Kelk, Lowthorp, Lutton's Ambe, Middleton, Nafferton, Neswick, North Frodingham, North Dalton, Rotsea, Ruston Parva, Southburn, Skerne, Sledmere with Croom, Sunderlandwick, Tibthorp, Towthorpe, Walton, Wansford, Weaverthorp, Wetwang. The population falling within the union at the 1831 census had been 14,718 — ranging from Eastburn (population 14) to Great Driffield (2,660). The average annual poor-rate expenditure for the period 1834-6 had been £5,930. The new Driffield union briefly carried on using the Cross Hill and Nafferton premises. In 1837 it acquired a vacant plot known as "Promise Close" between Westgate and Middle Street in Driffield on which to build a new workhouse. The construction was carried out by local builders Clark and Shepherdson. The Cross Hill workhouse was then sold and the money used to finance the building of the town's first police station on Eastgate North in 1843. Driffield Middle Street site, 1851. The new workhouse was two storeys high and brick-built. It broadly consisted of three ranges arranged around a central courtyard. A separate house for the master was built facing onto Middle Street. Driffield Middle Street workhouse and Master's house from the east, 2006. 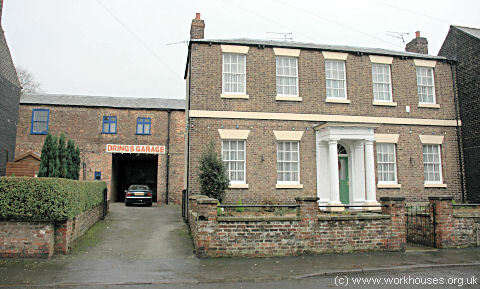 Driffield Middle Street workhouse eastern range from the north-east, 2006. The new building appeared to be unsatisfactory almost from the outset and alterations were regularly being discussed. In April 1839, it was proposed that "two lower rooms in the present storehouse be formed into male and female vagrant wards and two upper rooms into a female fever and female foul (i.e. venereal) ward . Room over the pantries be set aside for a male sick ward, a wall built opposite the men's privy as it now opens directly before the Master's sitting room. The first master and matron to be appointed were an ex-Quartermaster Sergeant of the 19th regiment of Foot, Robert Rainsbury, and his wife Mary. They were appointed several months ahead of the new workhouse being ready but when the time came to move in, the Rainsburys resigned on the grounds that the kitchen was unsatisfactory and that Robert had "not received any remuneration for his diet." Thomas and Theresa Escritt were appointed as their successors. In 1864 a smallpox outbreak in Driffield spread to the workhouse which lacked an isolation ward in which to place those affected. This, together with overcrowding, and the lack of space for extending the buildings, led to a decision in 1865 to erect a new workhouse on a new site. An official inspection of the old workhouse in 1866 criticised the absence of work for vagrants. On the first night that a work task was introduced, 12 of the 16 male vagrants applying for admission declined to enter; the other four left the next day informing the master that they would not trouble him again. 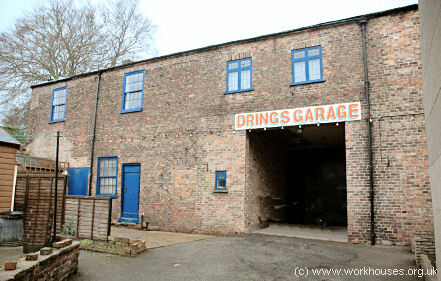 After its closure, the site was auctioned off and bought by Edward Gibson for £1000. The new building, for 215 inmates, was erected in 1866-8 at the north side of the Bridlington Road in Driffield. Designed by John Edwin Oates of Halifax, it cost £7,000 and was constructed from grey brick and stone. Its location and layout are shown on the 1927 map below. Driffield Bridlington Road site, 1927. The entrance block at the south contained the board-room, offices and chapel. To the rear stood the three-storeyed main building where males were accommodated to one side and females the other. Behind lay the single-storey kitchens and dining-hall. The infirmary lay at the north of the site. The central portion was constructed in 1866-8 but it was enlarged several times. The Driffield workhouse had a separate vagrants' ward which provided neither food nor baths, apparently because it was felt that such luxuries would encourage vagrancy. After 1930, the site was taken over by the East Riding County Council and redesinated as a Public Assistance Institution, accommodating the elderly and chronic sick. 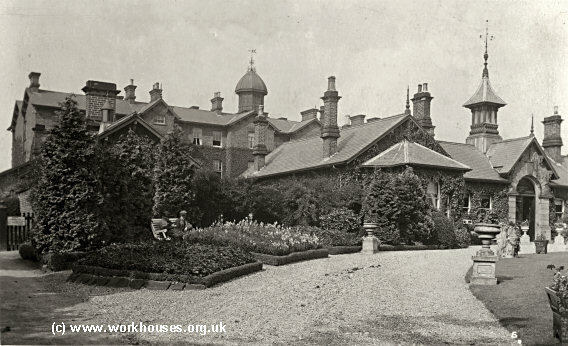 After the inauguration of the National Health Service in 1948, it continued in use until 1969 as a residential care home for the elderly, known as Wold House. In 1939-40, an Emergency Medical Service (EMS) hospital, known as Driffield Base Hospital, was erected at the north of the workhouse site. The hospital continued in operation after the war under the name of The County Hospital, Driffield. In 1948, it joined the National Health Service as the East Riding County Hospital, gradually taking over the workhouse infirmary and other buildings which had fallen into disuse. The hospital finally closed in 1990 and the buildings were demolished in 1992. Housing now occupies the site. Driffield former workhouse site from the south, 2001. From 1948 to 1950, Mrs. Margaret Walker was welfare officer at the former workhouse, and was responsible for its transition into an old people's home. Conditions were primitive when she first arrived. There were nearly 100 people living in the two separate buildings — one for the men and one for the women. "It was very plain and grim but it was clean and there was a good blazing fire. They slept in dormitories which contained about a dozen beds each with plain white counterpanes The floors were bare and under each bed was a regulation chamber pot. Both men and women wore workhouse "uniforms," the men grey tweed suits with collarless shirts, and the women blue and white striped dresses with a checked apron and black shoes and stockings. The first thing Mrs. Walker did was to put them into ordinary clothes and to try and make the living accommodation more comfortable. "I tried to get them into some way of taking a pride in themselves. They had never had anybody take an interest in them, so they were very anxious to please." She also set about trying to remove the stigma that was attached to living in a workhouse. "Until I arrived they weren't allowed to go out on their own and they used to have to sign a book if they wanted to go out." On Sunday evenings they were made to walk to church in Nafferton, the next village." I said "This is not a home of detention. They can come and go as they please." I was very unpopular at first with the staff with my new broom," recalled Mrs. Walker. In some respects, however, Mrs. Walker thought the workhouse system operated quite well. Like the idea that everybody had a job to do — the men would chop wood, stoke the boilers and do the gardening, and the women would clean, wash up and work in the laundry. They used to get a bit of pocket money and the men got half an ounce of tobacco a week and the women got some sweets if they wanted." As the change into a residential home came into effect the residents had to pay according to their means. The full cost at that time was £10 a week. Wanting to raise the tone of the establishment a little, she got rid of their pint mugs and introduced checked tablecloths and cups and saucers in the dining room. That passed off quite peacefully she recalled, but when she decided to remove the spitoons from the room where the men sat they were at a loss. "Where do we spit?" they asked her. One or two odd characters did turn up on her doorstep, some of them deposited there by the police. One of them was Lydia, a traveller who went from farm to farm doing seasonal jobs like potato picking. Lydia had never slept in a bed in her life and when she came to the workhouse she insisted on sleeping on the floor underneath her bed. At the start of the twentieth century, there was a general move to house pauper children in separate accommodation away from the workhouse. For theis purpose, the Driffield Board of Guardians bought three houses in the town, at 44-45 Victoria Road and 7 Bridge Street. These were joined in 1930 by Northern House on Scarborough Road. Changing the System in Wharfedale and Airedale Observer 24-11-1972, p12.